Sorry I’ve been offline for the last week. I’m currently struggling with energy, pain and tummy issues so have had to take a break from everything else to try and recover. I’d like to start this post off by thanking everyone who has already pledged their support for the Foggy Frog and the Pain Gang Kickstarter Campaign. We’ve reached 50% of our goal and we have just 8 days left to reach our target or we get nothing. Please get behind us now and help us reach our target! I know that if everyone helps out by spreading the word, and pledging their support (even $1 is great! ), we can reach our goal and get this book out to the world. So please use this next week to spread the word and join our campaign! I guess I can say that I had a pretty average life before getting fibromyalgia and chronic fatigue syndrome (CFS). I was working full-time as a teacher’s assistant, just graduated from college with a Bachelor’s degree in psychology, and I was pretty optimistic about the future. However, I wasn’t really sure where I was going career-wise. I worked in childcare since being a junior in high school, so I wanted to do something different. Boy, was I going to do a 360 a year after graduating from college or what! For sure, you know where the story is going. Yep, that was around the time when Foggy Frog and his friends decided to stay with me and made an oath that they would stick around! During the winter, the symptoms worsened. I got sick frequently, I was tired all the time, I was depressed, and the pain was now in my entire body, coming in a variety of ways (burning, pins and needles, gnawing). I knew that something was wrong because no matter how much I rested, these symptoms wouldn’t go away! Months later, I was finally diagnosed with fibromyalgia (however, I’m still waiting on the CFS diagnosis). I’ve been put on some medications which help with alleviating some of the pain, fatigue, and anxiety/depression. I also took an online course called “CFIDS & FM Self-Help Introductory Course” which further educated me on how to lessen the severity of the symptoms as well as techniques to use in order to have better control of my chronic illnesses. The course was very helpful and the textbook has some great tips! With having fibro and CFS came some losses and drawbacks: I’m unable to work, money is even tighter for me now, I can’t drive as much as I used to (I can only drive to places about 10 minutes away), I can no longer eat things that contain gluten (since these illnesses have triggered a gluten sensitivity), and my family helps out with errands. Despite the obstacles I have experienced, I have been led to many wonderful things: blogging, opening an Etsy shop where I sell my crocheted items, volunteering for the Meals on Wheels program, and I have met a lot of wonderful people through my volunteer work and through blogging. So yeah, I don’t like Foggy Frog and his friends very much…however, I’m learning to deal with them. With having certain tips and techniques up your sleeves, you can at least keep them at a distance! 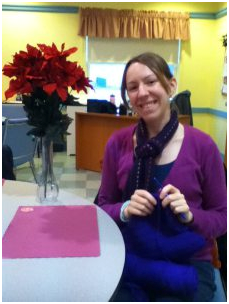 Jenn M. is the creator of the blog “Tangled Up in Passion” as well as the shop owner of the Etsy shop “Jenny Square Crochet.” Jenn has had fibromyalgia and CFS for over a year. Despite the hardships and changes that have taken place with her chronic illness, she has been able to find the blessings and positive opportunities from it. When she is not blogging or crocheting, she enjoys volunteering in the kitchen for the Meals on Wheels program, singing, walking her dog, and watching cartoons.